Wireless Wi-Fi Adapter to USB 2.0 or USB 3.0 port of your desktop, laptop PC or MAC, you can get extended Wi-Fi speed of 1300Mbps on 5GHz WiFi band or 450Mbps on 2.4GHz. It works with ANY wireless routers, including ac/a/b/g/n. 2. Insert the AC1750Mbps USB Wifi Adapter to connect any USB port. 2. Compatible with Windows XP/WIN 7/8/10/LINUX/MAC operation systems. 3. Capable of up to 128-bit WEP, WPA/WPA2, WPA-PSK/WPA2-PSK, 802.1X encryption. 4. Support WPS one key encryption. 5. With CCA technology, channel interference is effectively avoided. 6. With MIMO technology,data throughput and range are highly improved. 7. Smart AP switch function, easily share network resource. 8. Support Ad-Hoc and Infrastructure working modes. 9. User-friendly setup and hassle-free configuration. 10. Signal transmission mode: 3T4R(3RX and 4 TX). 1. Please plug the Wi-Fi dongle into the usb ports behind the computer host if you have a desktop. This way will let the Wi-Fi dongle get enough power. 2. Please turn off the built-in Wi-Fi when you use this product on the laptop. ( If your laptop has the built-in Wi-Fi ). Ultra-Speed USB wifi adapter on the market: Up to 1750Mbps Wi-Fi speeds on 1300Mbps(5G)+ 450Mbps(2.4G) and dual band, Performance to reduce freezing and lags when streaming and gaming. 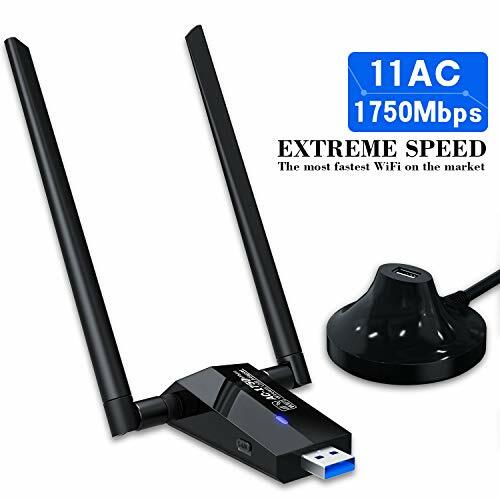 Ultra-fast AC1750 wireless adapter speed with 802.11ac. It works with ANY wireless routers, including ac/a/b/g/n. Super speed USB 3.0 Port: USB 3.0 supports transfer rates of up to 5Gbps-10 times faster than USB 2.0. It will let your computer connect to the wireless network and give you a unimaginable speed.Using the latest & most powerful 802.11ac Wi-Fi technology,It is the ideal for gaming online and seamless HD video streaming.Backwards compatible with USB 2.0 and 1.1 devices. External Powerful Antenna: The powerful dual antenna design can receive stronger signals.Upgrades PCs to 802.11ac with Ultra-fast AC1750 wireless adapter speed, You Can Get Wireless Speed on 1300Mbps 5GHz WiFi Band or 450Mbps Speed on 2.4GHz WiFi Band.Performance to reduce freezing and lags for gaming online and seamless HD video streaming. Awesome compatibility and easy to use: No drivers required for Windows 10! Just plug and play! Compatible with Windows 10/8/8.1/7/Vista/XP/2000, Mac OS 10.4-10.12.Works with any Wi-Fi routers, once you've installed the CD and run the software, you can simply insert the adapter to get connected and upgrade your PC,laptop or Mac to work with the latest AC WiFi router for faster speed and extended range. Important note AND customer services: 1. Please plug the Wi-Fi dongle into the usb ports behind the computer host if you have a desktop. This way will let the Wi-Fi dongle get enough power. 2. Please turn off the built-in Wi-Fi when you use this product on the laptop. ( If your laptop has the built-in Wi-Fi ).We will offer -24 MONTHS WARRANTY and friendly customer services. If you have any questions about this product by Ssnwrn, contact us by completing and submitting the form below. If you are looking for a specif part number, please include it with your message.